Over the past month or so I've been gradually planting up pots, moving plants and transforming our garden spaces. The weather has been amazing and I'm at long last experiencing what it is like to garden with light and heat! In our previous home we had a courtyard garden that was quite shady however we now have a front and back garden space to tend to, I'm trying to be much better with watering than I have ever been as in the warm weather everything drys out so quickly. I thought it would be a good time to tell you a little bit more about my gardening journey as it is becoming a real interest and a hobby. I'm spending more time listening to things about gardening and planting, watching TV programmes about gardens and reading books and blogs. Over the next month or so you'll see a flurry of posts about our garden so I hope that you will enjoy my little series. I'm trying to become a better gardener and so as part of the process I decided to take the plunge and create my own arrangement of flowers in a container. I've never done this type of gardening before, many of my gardening endeavours are really simple. 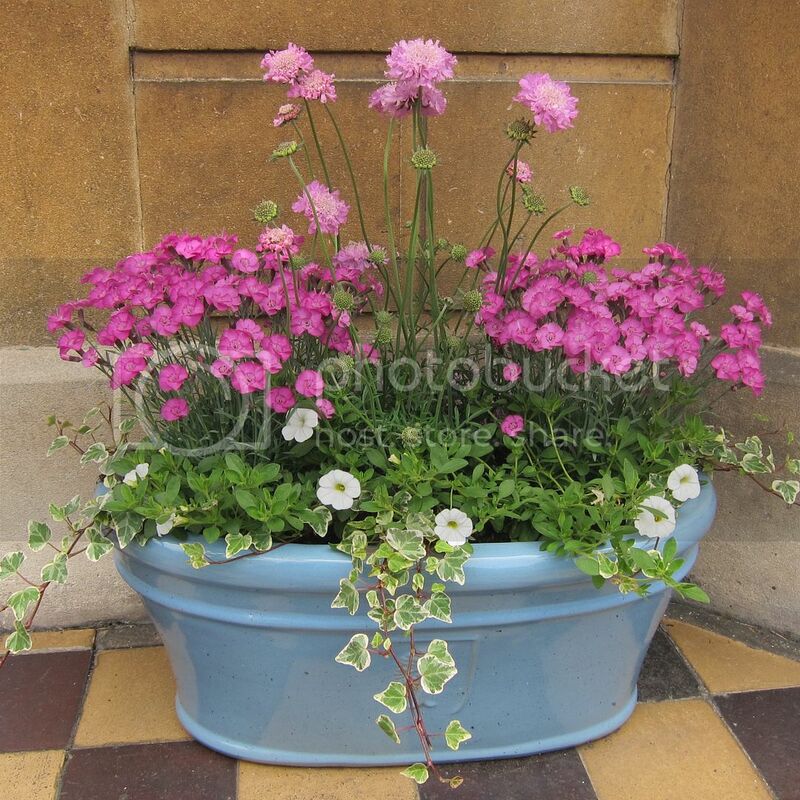 I tend to pot up a few of the same plant, like geraniums or cyclamen, into a pot or window box and put it on display. I love having the simplicity of the same plants grouped together however I decided that I wanted to get a little creative and wanted to buy a few different plants to create an arrangement in a container that would be placed at the front of our home on the doorstep. What sparked the project was finding this gorgeous baby blue coloured pot from the RHS collection at my local garden centre. Glazed pots like this are quite pricey for the garden but are a real investment bringing glorious colour and creating a feature in a space. I was given some money for my birthday a few months ago and I knew that I wanted to allocate it to buy something special for our garden space, this pot was just perfect. After finding the pot I really enjoyed wandering round the garden centre, discovering new plants, and thinking about how I could arrange them. I decided to go with a pink and white colour theme for the front of our home this year and luckily found some lovely plants. Working from the back of the pot I arranged a Scabious (Pink Mist) in the centre and surrounded it either side with one Dwarf Pink (Whatfield Joy Alpine Dianthus) either side. In front of the arrangement I added two trailing Calibrachoa White to create a lower layer. I then finished it off with a few pieces of varigated ivy to soften the edges of the pot. I love the combination of pinks in contrast with the blue pot as well as the different heights of the plants. I'd highly recommend getting a little creative and making your own arrangement in a pot. Each time I come home I smell the scent of the flowers, see bees enjoying the blooms and know that I created this arrangement, it makes me really pleased that I created something different.